We all know that London is steeped in history -- you can barely walk 10ft without coming across a plaque, monument, or listed building. But any city that’s over 1,000 years old (or more, depending on when you start counting) is bound to have a few secrets up its sleeve. We rounded up our favorite London building secrets... many of which are hidden in plain sight around the city. When the Jubilee line platforms of Westminster station were being constructed in the '90s, one of the biggest engineering concerns was how the excavation of the ground would affect nearby Big Ben, which stands only 34m away. This is because the tower, which measures nearly 100m high, rests on a foundation that is only 3m deep. The settlement of the subterranean soil caused by the construction would cause the famous clock to tilt -- it was feared as much as 12cm -- which may not sound like a lot, but experts warned that any tilting over 3.5cm would cause the foundation of the tower to crack and the clock to come crashing down. They ended up installing a system of tubes that injected a chalky substance into the soil to help solidify it as the construction continued. Experts monitored the movement of the tower and injected the soil 22 times. Ultimately, the clock did tilt only the maximum 3.5 cm... any more, and the London skyline might look very different today. After the existing buildings at 30 St Mary Axe were damaged by a bomb in 1992, plans were drawn up for a tower that would have been twice as tall as the present-day 30 St Mary Axe (more lovingly known as The Gherkin). Plans for the Millennium Tower, designed by Foster & Partners, called for a building 386m high, easily dwarfing The Gherkin’s modest 180m. 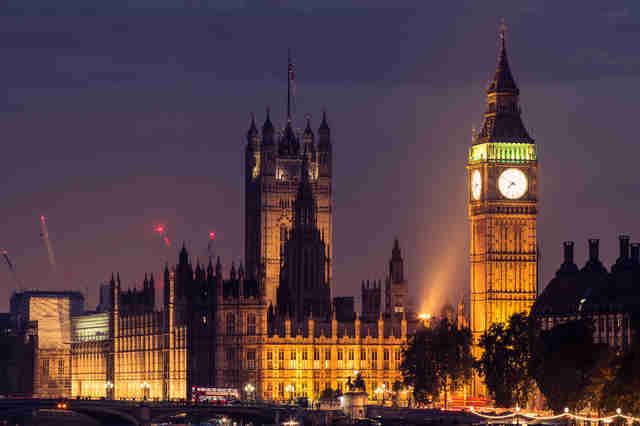 Ultimately, plans were scrapped after protests that the mammoth tower would clash with London’s skyline, and claims that it would disrupt flight patterns for Heathrow and London City airports. The Blitz -- one of the most famous events of World War II -- involved a months-long bombing campaign of London by the German Luftwaffe. When the campaign started on September 7, 1940, the German fighters focused their efforts on London’s East End, which housed many of London’s industrial and transport resources, and was also home to many of London’s working-class citizens. After five or six days, however, the Germans began bombing London’s West End as well, with several bombs hitting Buckingham Palace, where King George VI and Queen Elizabeth stayed in residence, in a show of solidarity with the citizens of London. According to historian Philip Zeigler, they were in real danger. "The King and Queen were there at the time [of the bombing] and would have been seriously injured had the windows been closed," Zeigler writes in London at War. 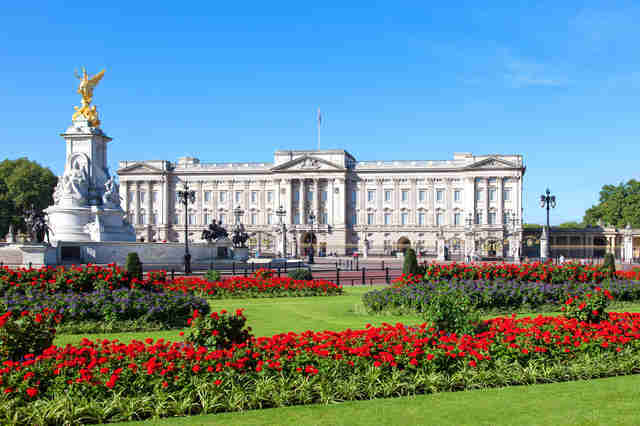 Bombing Buckingham Palace (and the West End) backfired on the Germans PR-wise, quelling the discontent of working-class Londoners who felt they were taking the brunt of the attacks. "If only the Germans had had the sense not to bomb west of London Bridge," famously quipped an MP, "there might have been a revolution in this country." Instead, bombing the palace created a sense of solidarity between royals and their subjects, as newspapers ran photos of King George and Queen Elizabeth meeting with Blitz victims. The Bankside Power Station (now known more commonly as the Tate Modern) may be one of the most striking modern and contemporary art museums in the world. 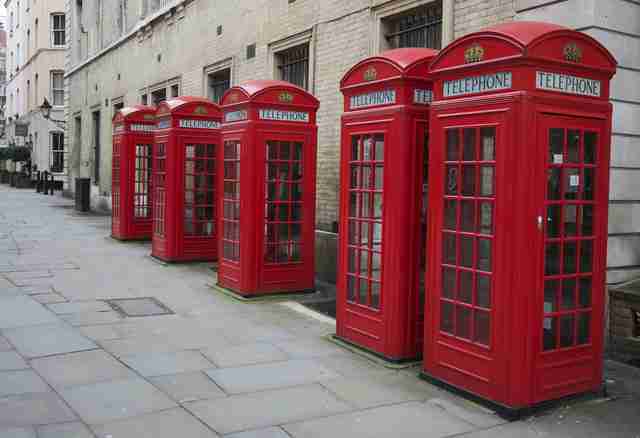 But architect Sir Giles Gilbert Scott didn’t just design buildings... he’s also responsible for the hyper-iconic "K2" red telephone box. 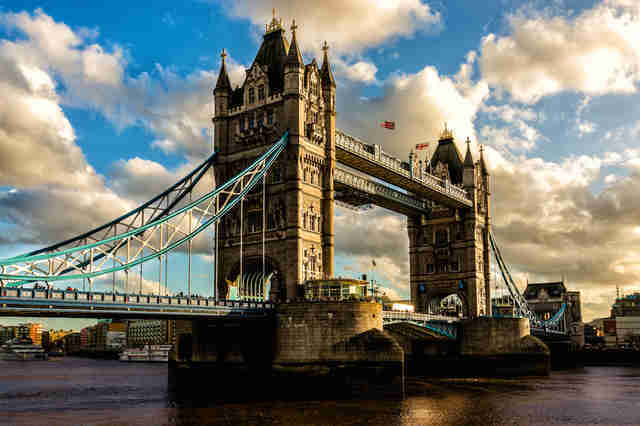 Tourists may confuse the Victorian construction for London Bridge (which we know is now in Lake Havasu City, Arizona), but the Tower Bridge has nevertheless become an integral part of the London skyline. The famous upper walkways, which now require a £9 admission, were originally deserted, due to their being accessible only by stairs. After their original opening, they became a haven for prostitutes and pickpockets, and were closed in 1910. But the bridge also practices a little sleight of hand: as you walk south from the north side of the Thames, you’ll find on the right side of the road one extra lamppost pillar... but no lamp. This is actually a chimney that feeds up from a fireplace inside a guardroom down below. Though it’s no longer in use, the chimney still blends in perfectly with its surroundings, as 40,000 people pass it every day -- and most are none the wiser. London’s newest, tallest skyscraper may not even be totally finished yet (as anyone who has to use London Bridge Station knows), but it’s easy enough to see where the name comes from... or is it? 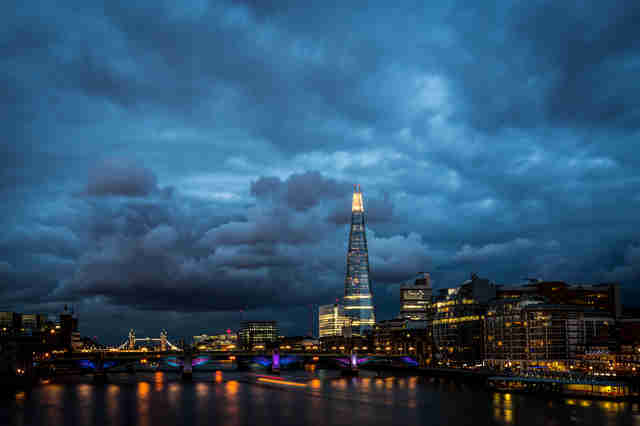 The name actually originated from an organization called English Heritage, which criticized architect Renzo Piano’s designs, claiming that the building would be "a shard of glass through the heart of historic London." Instead of defeating the building’s prospects, however, they only managed to inspire the building’s name. 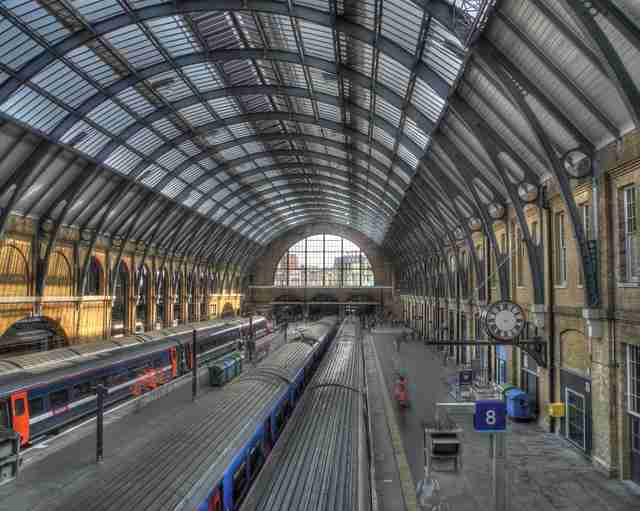 We all know that King's Cross is where you go to catch the Hogwarts Express from Platform 9¾, but did you know that there’s a secret river flowing underneath the station, as well? The River Fleet, which originates from Hampstead Heath and flows down to the Thames, runs right through King's Cross. When the area was being developed, the river was forced into a conduit (yeah, a sewer) in order to cross the Metropolitan Railway tracks. While the river itself is invisible today, the shape of the Great Northern Hotel gives it away, curving along the banks of the hidden river. Bonus secret: before it was called King's Cross, the area was known as Battle Bridge, named for a bridge over the River Fleet where Boudica, a queen of the British Celtic Iceni tribe, fought (and lost) a battle against the Romans. Rumor has it that her body might be even be buried underneath the platforms at King's Cross. The dome of London’s iconic cathedral has long been a symbol of British patriotism, and was a sign of London’s perseverance during the Blitz and throughout WWII. But it turns out the dome you see from the outside is an optical illusion -- the cathedral has an inner dome significantly lower than the outer one. Between the two is a massive brick cone that provides the structural support both for the dome and for the enormous stone lantern that sits on top of the cathedral. 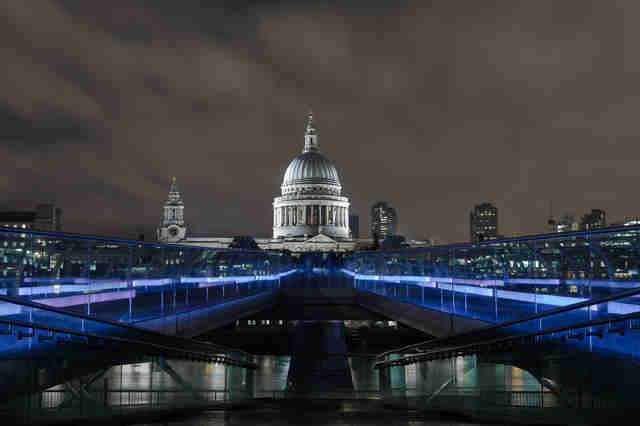 That’s why architect Sir Christopher Wren’s nickname was "cheeky genius." 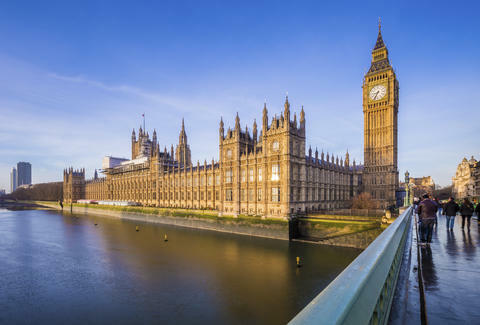 Any place that’s as old as the Palace of Westminster -- the location of every British monarch’s coronation since 1066 -- is going to have a handful of secrets, but we’ve picked just two. The next time you’re watching PM’s Questions (we all do this, right? 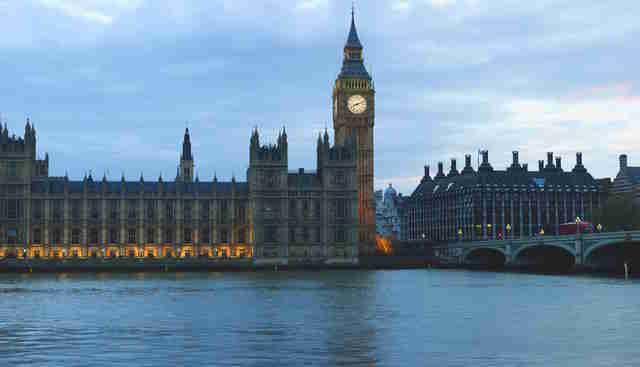 ), check out the double red lines on either side of the Commons, just in front of each front bench. MPs aren’t allowed to cross these lines, which measure two sword-lengths apart, the idea being that no one could lunge at the Prime Minister without giving him time to draw his own sword. Our other favorite secret about Parliament is actually hidden in plain sight: if you use the pedestrian tunnel that runs underneath Parliament St, you may see a strange-looking door: this is a secret (well, semi-secret) entrance to Parliament for MPs and Parliament staff. If you’ve ever tried to beat the crush of tourists around Parliament, you can understand why this would be a blessing for people who actually work here. 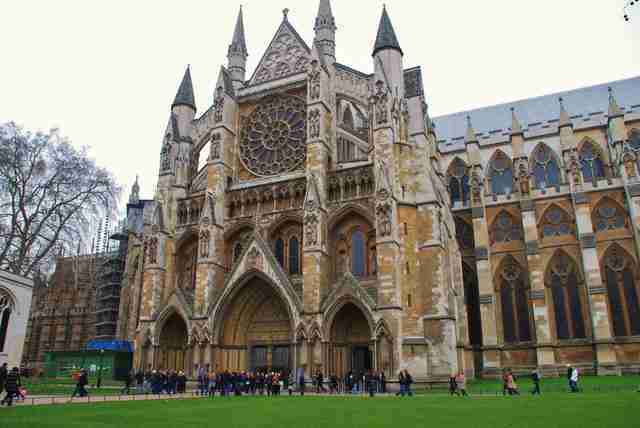 Sure, we know that a lot of the British monarchy is buried at Westminster Abbey, from Sæberht of Essex in 616 and Edward the Confessor in 1066 all the way up through George II (modern monarchs have largely opted for St. George’s Chapel at Windsor Castle). But there are tons of other noteworthy corpses buried here, from Charles Darwin and Charles Dickens, to Isaac Newton and Samuel Johnson. Playwright Ben Jonson is buried upright. Not one but two of the interred have their bodies buried in Westminster, but their hearts buried elsewhere (Thomas Hardy’s heart is buried in Stinsford; David Livingstone’s is in Zambia). My favorite burial is that of Elizabeth I, whose coffin is placed directly on top of that of her half-sister and predecessor, Mary I, aka "Bloody Mary," demonstrating that the siblings may die, but their rivalry is eternal. One other secret (or let’s say, less-well-known fact) about Westminster Abbey is that it has free, weekly Sunday afternoon organ recitals. It’s a great way to see the Abbey if you’re trying to avoid the admission fee -- just be careful where you sit, lest you find yourself on top of someone famous. Charlie Beckerman likes knowing things other people don't, and then showing off on dates and at parties. Check out his podcast, Serial Dater, or send him your own favorite London secrets on Twitter and Instagram @chozzles.